I left San Francisco International on September 18, 2013, excited and thrilled to finally be on my way to Riyadh, Kingdom of Saudi Arabia. My flight would be a long one, with a layover in Toronto, and another longer layover in Istanbul. My layover in Toronto was about 4 hours, and my layover in Istanbul would be 10 or 12 hours. I would first be flying on Air Canada, which I had flown on before and found them to be excellent. For the second leg, I would be flying on Turkish Airlines, which I had never flown on, but which had a great reputation. This stretched my travel time to almost two days, but hey, I could live with that. After all, I was going on an adventure of a lifetime! I considered trying to do a little bit of sightseeing in Istanbul, but decided against it since I knew nothing about getting around in Istanbul, and did not speak one word of Turkish. I arrived at the Toronto airport without incident. I decided to relax, do some reading, and get a little to eat. When boarding time came, I lined up with the other passengers, and presented my boarding pass and passport to the Turkish Airlines agent. Two of the agents peered curiously at my passport. “It looks like your Visa has expired.” I replied that that could not be possible, because it was my understanding that the Visa would not begin to run until I actually arrived in Saudi Arabia. They peered at my passport again, exchanged unreadable looks with each other, and one of them said, “I believe you’re right. I believe it’s the way you said it.” Of course I was right, so I huffed a bit, took back my passport, picked up my carry-on bag, and boarded the plane. The flight was really long – more than 12 hours, but the airline had almost all of the comforts of home. A large variety of movies, plug-ins for my iPhone, iPod and notebook computer, music and best of all, regular tasty meals. The seats were roomy and the flight attendants were responsive and accommodating. This was indeed the way to fly! The airlines in the USA could take a lesson from Turkish Airlines and do a much better job with making passengers happy. Our arrival in Istanbul was timely and I stepped into one of the busiest airports I have ever been in! I had never seen so many people speaking so many different languages and going in so many different directions. I had many, many hours to kill so I found a spot to stretch my legs and decided to take a nap. I napped for about an hour or two, but still had many more hours to wait. So, I got something to eat, fished out my Kindle and started reading. After a couple of hours reading, I decided to find the gate where I would board for Riyadh. I searched for what seemed like an eternity until I found the gate. Even though there were still several hours to wait, the gate area was already filling up with women cloaked in abayas and hijabs, and men dressed in thobes, with lots of little children running around in the area, squealing and chattering in Arabic. I knew I was at the right gate. I settled down in a comfortable area, but felt a little out of place in my uncovered Western garb, so I nervously searched around for someone who was dressed a little like me. When I saw a woman and man in casual, Western vacation garb, I breathed a sign of relief, sat back, and took another nap. The boarding call woke me up. 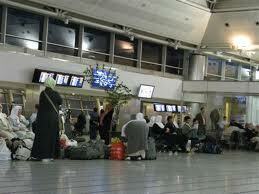 People were lining up for the flight to Riyadh. I jumped up, untangled myself from my bags and, heart pounding and sweat dripping off my face, I hurriedly hopped into the line for Riyadh. The Turkish Airline agent had a very rigid, authoritative air, and he examined everyone’s passport closely and carefully. Occasionally, he would bark at a passenger in Arabic or Turkish, and that person would leave the line, disappear for 15 or 20 minutes, get back in line and board the plane. For no apparent reason, I got more nervous and sweatier the closer I got to the front of the line. In tiny lengthy steps, I eventually reached the agent. He took my passport, peered at it closely, and began to count some mystery number on his fingers. He counted again, looked at my passport and Visa again, and told me to have a seat. What?!! I think I said or thought “what” or said and thought “what.” Have you ever crumbled? I had never crumbled in my life. But, at that moment, in that airport, in front of all of those people, I crumbled into tears and from tears to hysterics and from hysterics to hopeless hysterics, as the information sank in. The Turkish agent and Westerner didn’t quite know what to do. I was led by the agent into a back room. It was a busy Turkish Airline break room and hub. “D o-y o u-u n d e r s t a n d?” Y o u-c a n n o t-b o a r d-t h e-f l I g h t-t o-R I y a d h.” I was sobbing, nodding my head yes and no. I was lost. I was confused. This had to be a nightmare. This couldn’t possibly be real. I was in a dream, a time warp. I would wake up in the San Francisco Bay Area, and all would be well. Various Turkish Airline agents gave me water, and cool towels. Through a haze, I heard them tell me that they would put me up in a hotel for the night, and the next morning I could contact my Saudi employer, go to the Saudi embassy in Istanbul, and get everything straightened out. Little did I know that I would spend the next 30 days in Istanbul getting things straightened out.